← Augason Farms 48-hour emergency food supply review, Pt. 4: and we’re done here. 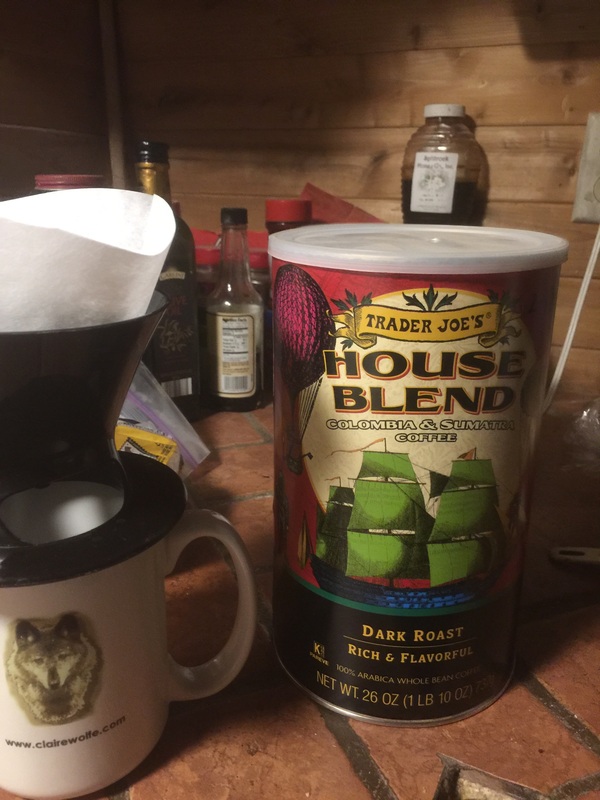 On this morning, September 25 2018, I opened the last can of Trader Joe’s House Blend Coffee that the Secret Lair will ever see. Takes me five weeks or so to empty one of these. I may ritually cremate the can. Still haven’t found a replacement I like as well. Sam’s Club, store brand “Member’s Mark” French Roast is great coffee at a reasonable price. Presumably Walmart’s store brand “Great Value” french roast is the same stuff and should be available within your circle of travel. They do have lighter blends if french roast is not your thing. Cremate the can????? Oh gosh why not save it and the lid to use for mouse and rat proof storage of something in your kitchen? A reminder of happy bygone days that will bring a smile of coffee drinking joy to your face. The aroma of the coffee will stay in the empty can for a while. You can open the lid and sniff until the smell is gone. Joel who is your moderator? Your new favorite coffee is out there somewhere. Relax and enjoy the search. Perhaps if you were to expound in detail just what it is about that coffee you like so much (body, aroma, acid balance, etc.) the coffee connoisseurs in your audience can help narrow down a suitable acceptable replacement? My moderator? I’m sorry, I don’t understand the question. That makes sense. Unfortunately I don’t have the vocabulary to describe what I like about it. Oh lawsy Mark, if even 10% of the people who read Joel’s blog sent him a can of their favorite coffee he’d have to build another addition to The Lair to hold all of it. It’s too bad he can’t describe what it is he likes about the Trader Joe’s. That would help limit the choices of brands to send him. But then he’d have a BUNCH of Christmas gifts to give out. What’s not to like? But then he’d have to keep track of which coffee came from which benefactor so as not to re-gift a can back to the person who sent it to him in the first place. Heck, he’d need a computer to keep track of all that . . .
Just give it right back to them and tell them he knows they like it because it’s the same brand as the can they sent him! Of course, if he gets 50 different cans of coffee, he doesn’t have to make more than one cup of each to figure out whether or not it works for him. He could feed the rest of whatever he doesn’t like to the chickens and get some brown eggs! If your supply situation makes it easier to get lots of cheap grounds over a reasonable amount of gourmet, you might want to investigate an Aeropress. Looks like a cross between a giant syringe and a french press, but makes the best coffee I’ve ever had with plain Folger’s. Downside is that I can make stupid strong coffee without it being bitter, so I use probably 1 1/2-2 times the grounds per cup. Old coffee cans have 1,001 uses. Do you, can you, grind coffee beans? Since I think highly of Sumatra Mandheling, I can understand how that House Blend is pretty good stuff. I’m less enamored of Colombian. Possibly, you might like a pure Sumatra, such as that from Daz Bog, which I thought was very good. Since that TJ’s stuff is a somewhat known quantity, you could try blending some Colombian and Sumatran yourself. Heck, a little web searching brings up lots of that type of blend, even “Mash Up” brand by Boyers, carried by WalMart (probably not in stores though). But that’s a medium roast. I suspect you can find another coffee equal to or better than TJ’s “House”, though perhaps not at the same price. I do grind the beans, of course. In fact I have a Plan B and a Plan C grinder. A decent coffee grinder is the only electric kitchen appliance I currently own. Coffee cans are of course very useful but TJ cans are less useful than most, being made of cardboard. Last year I accumulated so many #10 Mountain House cans I actually had to throw some away. Trader’s Joe’s Medium is pretty darn good! It might be an acceptable replacement for your beloved House Blend. I agree that TJ’s “Joe” is good stuff, particularly considering the low price. I bet it’d blend well with Sumatra Mandheling, which, BTW, I just dropped into the mail, addressed to Landlady.